Marvel’s God of Thunder will roar in your home starting next month! 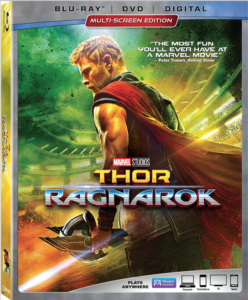 One of 2017’s biggest super hero movies, and recipient of three green arrows from the Now Playing Podcast critics, Thor: Ragnarok will strike digitally in HD and 4K Ultra HD on Feb. 20. The 4k Ultra HD and Blu-ray discs will follow on March 6. The 4k Blu-ray release will include HDR as well as Dolby Atmos audio. You can hear Now Playing Podcast’s review of the film now. Stay tuned for a review of the 4k Blu-Ray set when available.